Etcetorize: Motivated Monthly: Garden Party! Before we get to our little Garden party I need to show you a couple of stand out ideas from last month's 3 R party. I thought this neat window covering idea from Av Susanne was a great way to put all your doilies to good use. And Angie over at God's Growing Garden had an awesome recyle idea for old newspapers. Check out how to make these environmentally friendly starter pots on her blog. 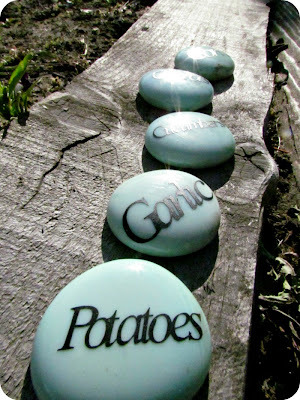 This month's theme is projects for the GARDEN! These are some garden markers I made recently to place in my garden. Just link up something you made in the garden, for the garden, or came from the garden. Pretty straightforward. 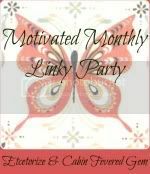 This party is co-hosted by my good friend Gen over at Cabin Fevered Gem, so your link will show on both of our blogs, getting double exposure! You can link up at either blog and you can feel free to follow both of us if you'd like (we'd be super thrilled), but it's not mandatory. This party will also be posted each week, so you'll get even more clicks throughout the month! We do ask though that you please post our button someplace on your blog where everyone will see it. The more people that join the party, the more fun and exposure it will be for all of you. Are you ready to get down and dirty in the garden?!? Go ahead, show us what you've got! What a fun idea to have a monthly theme! My thumb is a dark shade of purple, so I don't do much in the garden, but I will be back to see what everyone else creates! Ugh, I realized you ONLY wanted garden after I posted 3 links. I did read the post but I didn't thoroughly read the paragraph PRIOR to the first photos. Then I read your Linky rules and it didn't say anything about Garden . I don't know how to deleted the link. I'm so sorry. That's OK Danee...taken care of. Make sure to go back to yesterday's Make it Great party to link up. We totally want to see your great ideas!